Christmas 2017 with families of the Kwagala boys. Last year, many of you donated to our Christmas basket fundraiser and it was such a success! 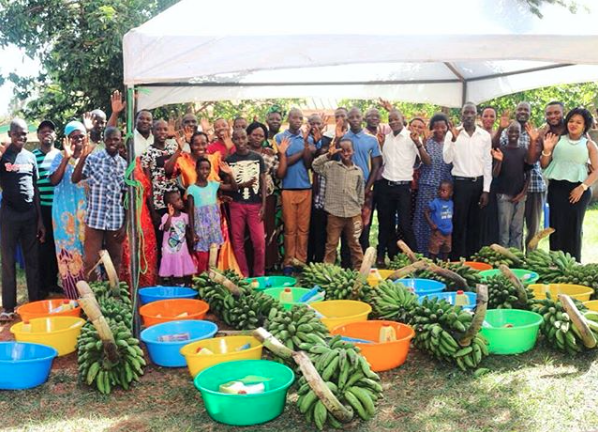 Each of the families of the Kwagala boys were invited to our compound for a big Christmas dinner and received a gift basket of various necessary house-hold items. Everyone was thrilled, it was such a wonderful day. This year we are looking to do something a little different. We still want to invite all of the families of the Kwagala boys for a big Christmas dinner, but we would like to extend that invitation to the large group of homeless children in our community as well. There is a large number of homeless children living on the streets of Uganda and this Christmas, we want to reach out to those that are near to us with a Christmas dinner. Each of the children in our home were once living on the street and it is our vision to continue to extend love to those who still find the street to be their home. We hope this would be an opportunity to strengthen our relationship with the children in our community in hopes of bettering their future and ultimately find their families and help mend their relationships. If you are interested in donating, scroll down and follow the donation prompts. Tax receipts are available for American and Canadian donations. Enter the amount you wish to give and press next. 1. On the next page select "Development Project" under the first menu. 2. In the next menu select "Uganda: Kwagala General Operations Fund". 3. Enter the amount you wish to give in the amount field. 100% of your donation is processed through our Canadian partner Hungry For Life.